Among media and ICT platforms in Kenya, radio remains the most widely available, reaching directly into more than 85 percent of adults’ homes in the country. Mobile phones are increasingly widespread, but they have not yet reached the near-universal coverage of radio. Fewer than half of all adults can watch TV in their homes, and other ICTs such as computers and MP3 players are available at home to only a tiny minority of Kenyans (AudienceScapes, 2011). Information communication technology includes any communication device or application, encompassing: radio, television, mobile phones, computer and network hardware and software, satellite systems and so on, as well as the various services and applications associated with them. The size and nature of the marketplace for radio has enlarged significantly since 2000, with over 50 new stations coming on-air, with at least 10 of them streaming online for worldwide listeners In particular, there has been an increase in vernacular-language stations, and the proliferation of these stations reflects a push towards addressing the various interests groups in the country. (Inter Media, 2005). The upsurge of stations is a result of liberalization of the airwaves, and listeners now have a wide range of listening choices, particularly entertainment services. The term new media generally refers to emerging communication technologies and applications, although all media formats at various points in time have been considered new. In this study, our use of the term ‘new media’ refers specifically to the internet and related digital technologies (e.g. cell phones, PDAs [Personal Digital Assistants]) and applications (e.g. blogs, file-sharing programs), as these are among the most newly emerged and evolving communication formats at present(Marvin, 1988). More specifically, although digital computers have existed at least since the mid 1940s with the advent of ENIAC (Electronic Numeral Integrator and Calculator) (Packer and Jordan, 2001), their widespread adoption and use in a communication context among the general world public is a more recent event that occurred during the 1990s, in part, with the internet’s public debut in the USA (Pavlik, 1998) and abroad. New media is a broad term in media studies that emerged in the later part of the 20th century. For example, new media holds out a possibility of on-demand access to content any time, anywhere, on any digital device, as well as interactive user feedback, creative participation and community formation around the media content. Another important promise of New Media is the "democratization" of the creation, publishing, distribution and consumption of media content.  What distinguishes new media from traditional media is the digitizing of content into bits. There is also a dynamic aspect of content production which can be done in real time. On the other hand social media is related with new media and is used for social interaction by use of highly accessible and scalable communication techniques. Social media is the use of web- based and mobile technologies to turn communication into interactive dialogue. Andreas Kaplan and Michael Heinlein define social media as "a group of Internet-based applications that build on the ideological and technological foundations of Web 2.0, which allows the creation and exchange of user-generated content." (Flew, 2008). Businesses may also refer to social media as consumer-generated media (CGM). A common thread running through all definitions of social media is a blending of technology and social interaction for the co-creation of value. Some of these platforms are Twitter, Face book, Myspace and many others. Radio stations like Capital FM and advertising agencies are using these to increase their reach for a larger clientele. Information communication technology has helped in the technological development of mass communication. With the increased role of the Internet in delivering news and information, mass communication studies and media organizations tend to focus on the convergence of, publishing, broadcasting and digital communication. The internet was created to provide easy access to much needed information, education and entertainment online. It provides less expensive option to these sources, because people can easily download an entire musical album from a website and use at a much lower fee. Also, introduction of this new technology has not only enhanced mass communication but also challenges the traditional concept of mass communication where according to the old definition, the source of a mass communication message was defined as a large organization whose message is sent to a large heterogeneous scattered audience. A case in point is electronic commerce on the internet which helps advertising agencies to advertise the products and services of their clients on the website which can easily be accessed by customers. Consumers are also able to shop on line at the comfort of their homes and offices which makes shopping easy. Secondly, information technology has impacted positively on advertising agencies to increase productivity since they could easily access information on customers through research on the internet, develop their advertisement and print hard copies of it, irrespective of the size of the copy. Likewise, public relations practitioners are able to easily analyze data collected from research on the internet and other sources and make it available to management. Furthermore, media houses have also enhanced their performance with the use of information technology. They are able to gather more needed information and feed their audiences with current news and information through their website and other electronic media. They are also able to use the media to solicit views from their audiences on various issues. Similarly, press houses are able to plan the pages of their news papers and easily print the hard copies using this technology. Transmission by Radio started in Kenya in 1927 with advent of the East African Broadcasting Corporation (EABC) which relayed BBC news to the colonies. English Radio Broadcasting begun in 1928. The Broadcasts targeted white settlers who monitored news from their home and other parts of the world. In September 1931, another agreement was made between the Government and the Imperial and International Communication Ltd which was to take over the responsibility of broadcasting for a term of 25 years. Later the Imperial and International Communication became Cable and Wireless Ltd.
First radio broadcasts targeting Africans came during the World War II to inform parents and relatives of African soldiers what was happening at the war front. English broadcasts continued until the beginning of the war when Asian and African programmes were introduced. In 1953, the first broadcast service was created for Africans. African Broadcasting Services (ABS) carried programmes in Swahili, Dholuo, Kikuyu, Kinandi, Kiluhya, Kikamba and Arabic. In 1954 a commission was set up by the colonial government to look into the future of broadcasting in Kenya. As a result of the recommendations of that commission, Kenya Broadcasting Services (KBS) was established in 1959 and regional stations were set up in Mombassa (Sauti ya Mvita), Nyeri (Mount Kenya Station) and Kisumu Station in Nyanza (at the time comprising the current Western Province and Kericho Districts). By 1960, it became evident, that independence was inevitable. The colonial government having used radio to suppress the nationalist movement did not want this important mass media organ to pass on to the African government on attainment of independence ( KCB, 2011). Since then radio broadcasting in Kenya has grown by leaps and bounds. The size and nature of the marketplace for radio has also enlarged significantly since 2000, with 34 new stations coming on-air, bringing the total in 2005 to 49 (Republic of Kenya, 2006b; CCK, 2005b). In particular, there has been an increase in vernacular-language stations, and the proliferation of these stations reflects a push towards addressing the various interests groups in the country. There are now a number of radio stations serving different ethnic groups and major religions in the country, and the interests of the youth (the largest segment of the population) are now being targeted by stations such as Kiss FM and others. Radio listenership in the country is quite high. In an InterMedia survey, it was found that 91% of the population had listened to the radio in the past seven days (InterMedia, 2005). The upsurge of stations is a result of liberalization of the airwaves, and listeners now have a wide range of listening choices, particularly entertainment services. Regionally-based vernacular language stations previously considered a threat to state security now abound and continue to open. Most are commercially-oriented and many have 80% of their content focused on non-serious entertainment issues, resulting in a need for radio to become more informative and balanced between information and entertainment. In terms of national services, six new stations, all private commercial, have emerged since 2000: Kiss FM, Kameme FM, Ramogi FM, Classic FM, House of Reggae and Inooro FM. There are now 13 national stations (see Figure 4 and Table 1), three of them are state-owned Kenya Broadcasting Corporation (KBC) outlets - KBC English, KBC Kiswahili and KBC Metro FM - and the rest are private commercial stations. The even greater growth in stations over the past five years has been at regional/local level. State-owned KBC has created five new regional services, and 16 new private commercial services have been launched at regional level (see Figure 4 and Table 1). International radio stations have also increased since 2000, from four to eight, and two non-profit community station projects, still at an experimental stage, have been launched: Man’gelete and Maseno13. One of the reasons hindering the expansion of community radio in the country is the lack of support for communities to start their own radio stations and existing bureaucratic bottlenecks in licensing. More support in this area is required. 98.4 Capital FM is a Kenyan urban music radio station. Its offices are situated on the 19th floor of Lonrho House, along Standard Street in Nairobi's Central Business District. It is owned by Chris Kirubi who is also a presenter for the mid- morning show. Started in 1996 and based in Nairobi, Capital FM now caters to Mombasa, Western Kenya, as well as the international community, via its website. It was the second FM station to be opened after 101.9 Metro FM shortly after the liberalization of Kenyan airwaves, and although several other FM stations have continued to crop up, catering to all tastes, 98.4 Capital FM continues to be a popular station especially among the middle-class and upper-class markets. The presenters are large, engaging personalities who play a mixture of Hip Hop, Rhythm and Blues, Rock, Neo Soul, New Jack Swing, World Music, Jazz, Techno and Dance music, transcending gender, all age groups, backgrounds and cultural boundaries . It’s been home to most of Kenya’s pioneer radio presenters for example Caroline Mutuko, Jimmy Gathu, Sean Cardovillis, Phil Mathew, Zain Verjee and Patricia Amira. Capital FM and other radio stations in Kenya like Kiss FM, Classic Radio, and Easy FM have adopted the new media platforms to access a larger clientele. Capital FM has an interactive website which it uses for this purpose. A look at the website shows some rich content in the following: Capital FM website is very rich with all type of features from blogs to live broadcast to sports. It highly interactive as one can engage in live chats. Other sections have events, advertisements, local and international news. For the listeners in the Diaspora it provides an opportunity to exchange with the listeners back at home on issues that are crucial to the social economic development of the country. The business section has a comprehensive array of activities. One can register his business and advertise online. There are also business news on the current scene. One can also buy and sell shares in the Nairobi stock exchange as it’s hosted online. 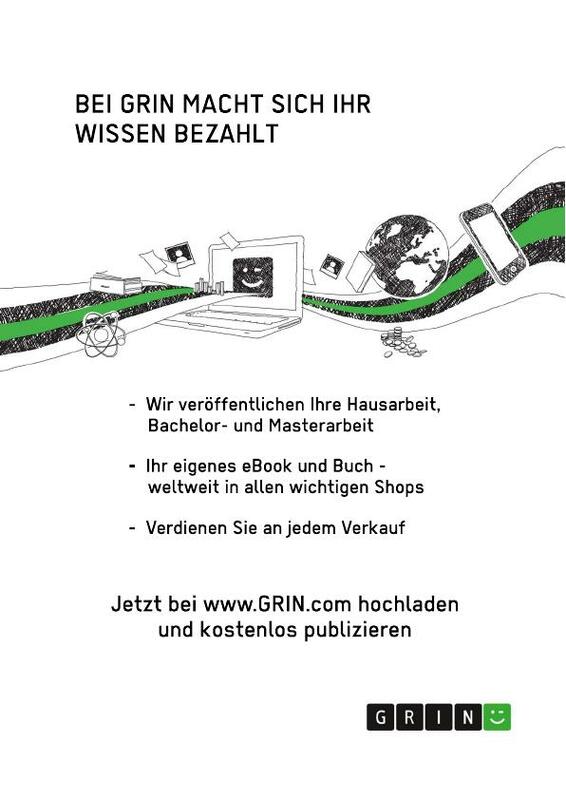 Lastly there is a section on job search. As noted the website is highly interactive. Many FM stations are streaming online but what has set Capital FM on a class of its own it has gone a step further and created shows that mainly focus on the audience in the diaspora.The two shows are: After Hours from 10pm to 1am hosted by Chao Mwatela and the Urban Nights show hosted by Charles Kiarie and Muchai from 1am to 5 am. The urban nights show is a breakfast show for the audience in the diaspora and mainly discusses issues affecting Kenyans living abroad. Due to its longevity in the market, Capital FM has the highest advertising revenue among FM radio stations in the country. It has moved a step further and attracted advertisers that specifically target the audience in the Diaspora for example Kalahari.com, Canon Computers, Mamamike.com, Nakumatt Supermarket, Events promotions for shows that are taking place abroad for example Eric Wainainas ‘More Fire’ musical in different cities across the U.SA and Kenyan Theme Nights in U.S.A.
- To determine whether the staff members are well trained for use of these platforms. - What is the impact of the new media on broadcasting media (Radio)? - How is new media changing the face of media broadcasting in Kenya? - Is the staff of the radio station well equipped to handle the new media platform? - What has been the response of customers to the enhanced use of the new media? - What are the challenges faced by the radio station in setting up this platform? Capital FM is one of the Radio stations that has been in the market for a long time. To reach its wide range of market, it has embraced the new media platforms to reach a wider market segment. Through its interactive website it has been able to reach a wider range of customers especially in the Diaspora. These technological innovations are seen as ways of helping the African diaspora stay connected with their country of origin (Senghor, D. 2008). With the coming of the fiber optic cable, it has become easier and faster to communicate and send data via the internet. This has made it possible for Capital FM to launch new products through the internet. This study will enlighten radio stations on the important role that use of new media platforms will enhance their businesses. At the policy level, the ministry of information will come up with rules and regulations governing the use of new media and encouraging more radio stations to utilize the platforms in an ethical manner. Information communication technologies (ICTs) are the fastest growing subsector in the country; contributing about Ksh 450 billion to the economy. It is the main economic stimulant in the country. The impact of the new media in Kenya is not yet the subject of reforms and academic interest. The spread of the use of new media technologies and social networking is still limited. The majority of people in the rural areas are not conversant with the use of new media platforms to interact with others despite the fact that they still do use mobile phones in communicating with relatives and friends. This has confined the use of social networking platforms to the urban centers. Despite the limited rural reach, all the commercial radio stations are increasingly using new media platforms to reach a bigger audience. They have especially encouraged the use of mobile phones from across the country for call- ins and participating in radio discussions. Some listeners are also using the available cybercafés to access e mails and hence post their views to the Radio broadcasters. This is a new area in the broadcast environment in Kenya and many radio stations are still struggling to adopt this type of technology. A review of literature shows very few studies have been undertaken to assess the level of adoption and the challenges faced by these stations as they shift into this area. The aim of this study was to fill this gap by analyzing the challenges faced by one of the premier Radio Stations. 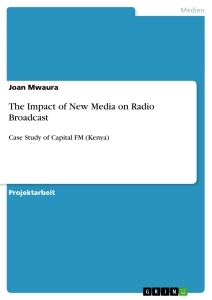 It investigated the impact new media is having on radio broadcasting in Kenya. Capital FM is an example of a station that is using the new media platform to reach a wider audience especially the international community. - New Media: This is a broad term in media studies that emerged in the later part of the 20th century. This can be referred as infrastructures with three components: the artifacts or devices used to communicate or convey information; the activities and practices in which people engage to communicate or share information; and the social arrangements or organizational forms that develop around those devices and practices. - Social media: This is a group of Internet-based applications that build on the ideological and technological foundations of Web 2.0, which allows the creation and exchange of user-generated content. Businesses may also refer to social media as consumer-generated media (CGM). A common thread running through all definitions of social media is a blending of technology and social interaction for the co-creation of value. Some of these platforms are Twitter, Face book, MySpace and many others. - A Blog: This is a type of website or part of a website. Blogs are usually maintained by an individual with regular entries of commentary, descriptions of events, or other material such as graphics or video. Entries are commonly displayed in reverse-chronological order. Blog can also be used as a verb, meaning to maintain or add content to a blog. - The Internet: This is a global system of interconnected computer networks that use the standard Internet Protocol Suite (TCP/IP) to serve billions of users worldwide. It is a network of networks that consists of millions of private, public, academic, business, and government networks, of local to global scope, that are linked by a broad array of electronic, wireless and optical networking technologies. The Internet carries a vast range of information resources and services, such as the inter-linked hypertext documents of the World Wide Web (WWW) and the infrastructure to support electronic mail. 2.1.1 New Media versus Cyber culture - Cyber culture are the various social phenomena that are associated with the Internet and network communications (blogs, online multi-player gaming), whereas New Media is concerned more with cultural objects and paradigms (digital to analog television, iPhones). 2.1.2 New Media as Computer Technology Used as a Distribution Platform - New Media are the cultural objects which use digital computer technology for distribution and exhibition for example the Internet, Web sites, computer multimedia, Blu-ray disks etc. The problem with this is that the definition must be revised every few years. The term "new media" will not be "new" anymore, as most forms of culture will be distributed through computers. 2.1.3 New Media as Digital Data Controlled by Software - The language of New Media is based on the assumption that, in fact, all cultural objects that rely on digital representation and computer-based delivery do share a number of common qualities. New media is reduced to digital data that can be manipulated by software as any other data. New media operations can create several versions of the same object. An example is an image stored as matrix data which can be manipulated and altered according to the additional algorithms implemented, such as color inversion, gray-scaling, sharpening, rasterizing, etc. 2.1.4 New Media as the Mix Between Existing Cultural Conventions and the Conventions of Software - "New Media today can be understood as the mix between older cultural conventions for data representation, access, and manipulation and newer conventions of data representation, access, and manipulation. The "old" data are representations of visual reality and human experience, and the "new" data is numerical data. The computer is kept out of the key "creative" decisions, and is delegated to the position of a technician." e.g. In film, software is used in some areas of production, in others are created using computer animation. 2.1.5 New Media as the Aesthetics that Accompanies the Early Stage of Every New Modern Media and Communication Technology - "While ideological tropes indeed seem to be reappearing rather regularly, many aesthetic strategies may reappear two or three times...In order for this approach to be truly useful it would be insufficient to simply name the strategies and tropes and to record the moments of their appearance; instead, we would have to develop a much more comprehensive analysis which would correlate the history of technology with social, political, and economical histories or the modern period." 2.1.6 New Media as Faster Execution of Algorithms Previously Executed Manually or through Other Technologies - Computers are a huge speed-up of what were previously manual techniques. e.g. calculators. "Dramatically speeding up the execution makes possible previously non-existent representational technique." This also makes possible many new forms of media art such as interactive multimedia and computer games. "On one level, a modern digital computer is just a faster calculator; we should not ignore its other identity: that of a cybernetic control device." 2.1.7 New Media as the Encoding of Modernist Avant-Garde; New Media as Metamedia - Manovich declares that the 1920s are more relevant to New Media than any other time period. Meta-media coincides with postmodernism in that they both rework old work rather than create new work. New media avant-garde "is about new ways of accessing and manipulating information” hypermedia, databases, search engines, etc.). Meta-media is an example of how quantity can change into quality as in new media technology and manipulation techniques can "recode modernist aesthetics into a very different postmodern aesthetics." 2.1.8 New Media as Parallel Articulation of Similar Ideas in Post-World War II Art and Modern Computing - Post world War II Art or involves creating images by systematically changing a single parameter. This leads to the creation or remarkably similar images and spatial structures. "This illustrates that algorithms, this essential part of new media, do not depend on technology, but can be executed by humans." The consequences of new media technologies -- the socio-technical outcomes of the mutual shaping process -- are ubiquity and interactivity. Ubiquity is the sense that new media technologies 'affect everyone in the societies where they are employed', even if not everyone in those societies actually use them. One example of the sense of ubiquity - or, more accurately, the sense that ubiquity is both desirable and inevitable -- was seen over a decade ago when the existence of a 'digital divide' was identified in the U.S. (National Telecommunications and Information Administration, 1995, 1998). Subsequently, this single issue stimulated an enormous outpouring of empirical research and commentary, both supporting and critical, around the world. Some observers argued that the uneven or inequitable distribution of ICTs and the abilities to use them constituted a clear and pressing social problem. Others questioned the extent and/or the significance of the differences among social groups, or suggested that the problem would solve itself as the technologies diffused (Bucy and Newhagen, 2004; Compaine, 2001). The debates themselves generated a variety of policy and regulatory schemes intended to rectify various divides or gaps among ethnic and economic groups, states, neighborhoods, nations, regions, and so on, such as the e-rate subsidy for Internet access in U.S. public schools and libraries, and the European Union's Information Society initiative. Perhaps what is most notable about the sheer volume of interest and work in this area is that it has been built on the assumption that the ubiquity of ICTs is a public good, with surprisingly little analysis of whether ICTs are, indeed, to be uncritically promoted, or whether gaining access to the Internet or other new media technologies is so obviously a ‘good thing’. The model of access most often invoked with regard to ICTs is that of voice telephony, where telephone service is seen as a basic necessity and therefore governed or regulated on the basis of 'universal service' or 'universal access' principles or obligations (Lievrouw, 2000). In contrast, the ubiquity of mass media (or lack thereof) was not generally framed this way. No literature sprang up to document and criticize television or radio 'divides', for example, when those technologies were introduced. On the contrary, considerable research effort was devoted to controlling or minimizing exposure to television - to reduce children’s viewing, or to regulate adult tastes for films, video and electronic games.